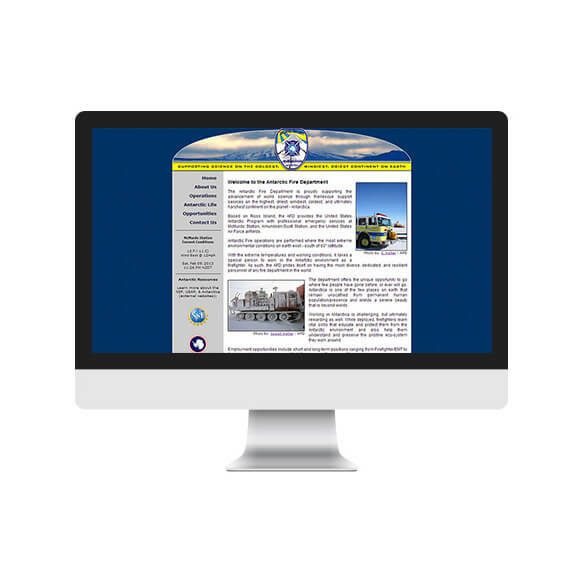 The Antarctic Fire Department project scope called for an informational website designed to be a recruitment tool for the department. Clean, simple, straight-forward design with a focus on maintaining a corporate, professional elegance was the name of the game. We built this website from the ground up, coding to current web standards and adding simple jQuery and CSS animations to the site to make it look great in all browsers. The site is viewable on all computers and devices. The header features images from Antarctica that are different and relevant to each individual page’s content. The end caps of these images in the header continually rotate through various other photos of the Antarctic Fire Department. The meat & potatoes of this project is the content. Elegant copy writing coupled with breathtaking photos paint a picture in the viewer’s mind of the pristine beauty of their potential working environment, subtly calling the adventurous them to apply to work for the Antarctic Fire Department.